As the world’s population continues to grow towards nine billion, new ideas for managing food security are necessary. In 2014, Professor Evan Fraser, now the Food Institute Director, decided University of Guelph students should have the opportunity to turn their own ideas for feeding the world into reality. The result was the Feeding 9 Billion Challenge. Now in its fourth year, the event continues to gain momentum and assist students in distinguishing themselves as social entrepreneurs who can affect change. Kelly Hodgins, Feeding 9 Billion Challenge coordinator, explains how the Challenge, now a part of the ICON course, is an opportunity for students to try something new and equip themselves with new skills for life after graduation. What is the Feeding 9 Billion Challenge? What is ICON? Kelly Hodgins: Feeding 9 Billion (F9B) is an initiative that develops activities for students across Canada so that they can take action to create a more sustainable, healthy, and just food system. In essence, the F9B initiative supports young people in tackling the enormous challenge of feeding a global population of nine billion by the year 2050. 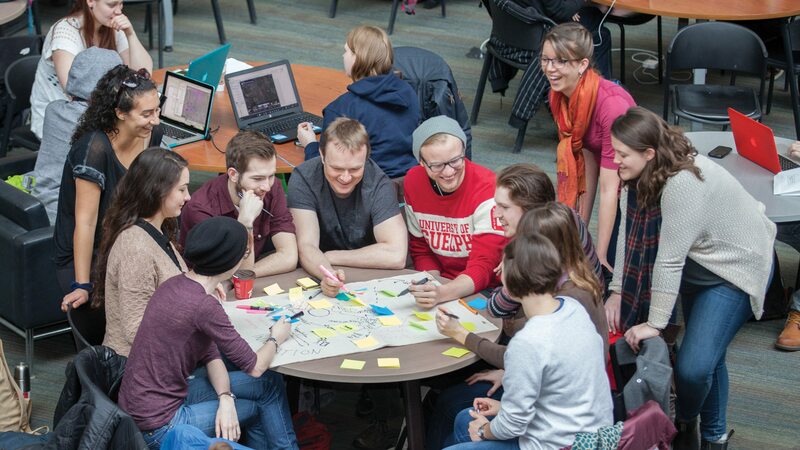 ICON is a course at the University of Guelph that allows students to work on real-life projects, and learn by getting out of the traditional classroom and doing.ICON stands for Ideas Congress. This semester F9B and ICON are joining forces in the Challenge+ICON course. The theme of the semester will be food security, and students enrolled will develop projects related to food and agriculture. What makes the Challenge+ICON different from traditional classes? KH: It’s very different compared to a normal course. On the first weekend of classes (Sept 23-24th) students participate in a fast-paced and motivating “Feeding 9 Billion Challenge Weekend”. This 24-hour event is guided by two facilitators who create an atmosphere where students can generate novel ideas: be it an app, an education campaign, a novel food product, an agricultural technology, a social enterprise, a game, a new way of achieving a social good within the business, a video series, anything! Past participants have designed viable businesses, opening up a world of possibilities for life after university. Over the course of the rest of the semester, students in ICON work with the teams they founded at Challenge Weekend to develop those project ideas into reality. The class meets on specific dates throughout the semester to support and propel the projects forward. KH: ICON is open to 3rd year students and above. It’s unique because students from any degree program can earn this credit. The task of creating a healthy food system for nine billion people is not easy, and we need all kinds of perspectives and ideas. What kind of support do students get for their projects? KH: Instructors support, facilitate, and provide resources, coaching and networking. There is the expectation that students will take initiative and be self-motivated, but everyone is supportive and invested in seeing your project develop and be real in the world! How far will students get in developing their innovation? KH: We want to see students develop innovations, businesses, campaigns, that go beyond the confines of a “class project”. As program manager, I spend my year creating relationships with external organizations like fellowships, business incubators, competitions, and funders so that when the semester is over, there is a network available to students to launch their projects even further. How does a class project have an impact feeding nine billion people in our planet’s future? KH: A four-month course is a short time when we are talking about complex global issues, however we don’t see projects in ICON as normal class assignments. Instructors design a program that equips students with skills, networks, resources, and confidence to continue as “change-makers”. This isn’t a traditional class, so how are students evaluated? KH: The evaluation structure we’ve designed is created in the student’s best interest. Each assignment is directly related to advancing the project, incentivizing students to keep propelling forward on their project as well as providing the right resources and support at the right time. Some of the assessment is also based on participating in the Feeding 9 Billion Challenge which is the kickoff to the semester, and it’s an unforgettable and fun event to participate in. What’s your favourite part of the Challenge+ICON? KH: I love working with ambitious students, and it makes me so excited to watch their confidence transform over the course of the semester. They are incredibly impressive, and when the students finish the course, they see themselves as social entrepreneurs. They’ve gone on to build their projects into businesses, to apply these skills into great jobs, and to get involved in food-security projects across the world. I feel like those outcomes are rather worthwhile, from a one-credit course in one semester! I’m jealous I can’t re-do my undergraduate degree so I can take part too. In the meantime, I have the best job in the world working with these change-making students.